s Atlanta readies to host the 2009 BIO International Convention in May, Georgia's life sciences sector by most accounts is percolating nicely, but faces some hurdles if it is to one day join the elite list of industry hubs such as Boston, San Francisco and San Diego. The BIO event figures to put a global biotech spotlight on Georgia and promote future development in the state. Some of Georgia's life science leaders say the biggest challenge, as it is in most areas, is finding sufficient venture capital. Others say funding will always chase good ideas. Industry leaders also say that the state offers many key advantages such as an array of research institutions, key government agencies such as the Centers for Disease Control, and an attractive quality-of-life level. Georgia's roster of life sciences companies ranges from startups to more advanced companies such as Altea Therapeutics, which is working to develop and commercialize a drug delivery system that works through the skin through a small skin patch. The company was founded about 10 years ago based on technology derived from research at the Georgia Institute of Technology. The company employs about 50 and has attracted $70 million in venture financing thus far. Eric Tomlinson, Altea's president and CEO, says the life sciences sector has made great progress in Georgia, but the state faces many challenges. "BIO 2009 is a critical event for us," Tomlinson says. "It enables us not only to showcase the industry that's here and growing, but also the academic and public health elements in Georgia that are obviously outstanding in their own right. BIO provides the ability to interact with potential partners whether they are in pharmaceuticals, government, other countries or financial institutions." "I am delighted with the level of support given by the state and by local industries," Tomlinson says of BIO. "Clearly it's a major event for us. It's not trite to say it's the Olympics of the biotech industry. Every company worldwide will be represented here and there is a great opportunity for the state and region to promote itself." Tomlinson describes Georgia's biotech sector as being fairly successful, but he notes that it is a modest industry compared to the top U.S. biotech centers. He says Georgia has some success stories, both locally grown and the U.S. headquarters locations of larger companies such as UCB and Solvay Pharmaceuticals. But he says there are few strictly life science companies that are leading the way. He notes that two of the sector's promising companies, Artherogenics and Inhibitex, have experienced setbacks in recent years with their lead compounds. Altea Therapeutics is seeking to commercialize its transdermal drug delivery systems. "My personal view is you grow an industry by incubating and supporting incubation by entrepreneurial behavior, support at the academic level and at the infrastructure level," says Tomlinson. "That takes a long time. Companies that looked as if they could really make it big here haven't. The lesson is that the region won't make it big until a company really makes it big." Tomlinson says the Georgia Biotechnology Partnership should work hard to educate state legislators, many of whom do not fully understand the industry. "Go to Cambridge [Mass.] and you will see that legislators are one with the industry," Tomlinson says. "They know what is happening. They know what a biotech product is. Until that takes place here, we are missing an important component. There are a number of small companies like our own fighting hard to be successful. It's like getting hit with a hockey stick. You build value and 'Wham!' it happens or 'Wham!' it doesn't happen. There are a number of companies at that stage in Georgia, and it is dangerous to predict where it will go." Solvay Pharmaceuticals has its U.S. headquarters in Marietta. 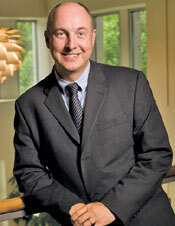 Dr. Stephen Hill moved south from Boston in May to take the reins as president and CEO. He believes that while the Atlanta region is less famous than the big three biotech hubs, the pieces are in place for the industry to thrive. "There is a nice range of different sizes of companies in pharmaceuticals, biotech and startups," he says. "We have a very strong academic base here. I would argue that it is as good as anything in the biotech hubs or the world for that matter. There is good representation of non-profit agencies, there is a big contract services commitment with Quintiles and clearly there is no shortage of support functions." Hill says BIO will give the region a change to show it is a good place for the biopharma business. In October the company revealed it would not move forward with the construction of a proposed $386-million influenza vaccine manufacturing plant. The firm had received in May 2006 a $298-million grant from the U.S. Dept. of Health and Human Services that was intended in part to help subsidize such a plant's construction. The company was considering both Athens, Ga., and Birmingham, Ala., for the plant. But in the end, it decided to cancel its plans, citing a range of factors including uncertain market volume, government construction reimbursement restrictions that maxed out at 40 percent, and the company's plans to seek FDA licensure for the vaccine product it already manufactures in the Netherlands. "The company's current $298-million contract with HHS, awarded to Solvay Pharmaceuticals in the U.S. in 2006, covers the development and testing of new influenza vaccines, including pandemic vaccines that are produced using cell-based technology," read a company statement sent in response to an inquiry. "The decision not to build a facility does not affect the company's commitment to the current contract to continue the development of these vaccines." Hill, meanwhile, believes attracting a major manufacturer to Georgia requires a united approach. He says Georgia needs a critical mass of companies in order to attract, support and retain a deep talent pool. "We have everything that is needed, but we don't have everything in critical mass. One of the big advantages of the big hubs is that if your job disappears, you can be assured that you can move to another company." Both Tomlinson and Hill say lack of venture capital, especially local capital, is the major impediment to the industry's growth. Merial Animal Health moved its global headquarters from Iselin, N.J., to Duluth, in 2001. Merial's CEO José Barella says the move gave the company proximity to its R&D and manufacturing sites in Athens and Gainesville. Merial has benefited from collaboration with the University of Georgia's School of Veterinary Medicine, he says. "An enhanced life sciences community in Georgia gives us access to a highly skilled work force in bioscience and technology, especially in lower level technician roles," Barella says. "We still have the need to look outside Georgia to fill positions requiring candidates with higher levels of seniority and experience in fields such as biomedical research, research and discovery, product development and bio-manufacturing. A more robust local biotech community would be a great advantage to all companies." Steven Burrill, CEO of San Francisco-based Burrill & Co., a life sciences merchant bank with nearly $1 billion under management among 80 life sciences companies, begs to differ regarding lack of venture capital being an impediment to Georgia's life sciences growth. "That's everybody's favorite argument, but it's absolute BS," says Burrill, who has been involved in the sector for 40 years. "If you look at Atlanta as an example, if you had fabulous entrepreneurs on every street corner, every venture capitalist in the country would be flying there so much they would get tired of flying there." G. Steven Burrill, CEO, Burrill & Co. The current economic downturn notwithstanding, he says there is always money available for good ideas. "The shortage is of entrepreneurial people, companies or ideas in the area," he says. "We see 100 to 150 deals a month, and we probably invest in one per month. When I count the number we see from Georgia as opposed to other places, it's relatively low. Shame on them, if companies in the state think there isn't capital there. There is capital in the region, nationally and internationally, that would love to invest in a good opportunity. We just don't see much opportunity coming our way from there. From my standpoint, it is interesting how few we see." Burrill says Atlanta is in the second tier of life sciences clusters, but it does have growth potential. "Atlanta and Georgia are nice places to live and have a high quality of life. The San Francisco Bay area is expensive, so there is no competitive advantage there. The location of where you build a company is not as important as having a bunch of people make it happen. I have a billion dollars in our venture capital business, and I would put every dime of it into the right idea. I am agnostic geographically when it comes to good ideas." Barella says Georgia should strive to improve its global stature as a scientific community. He cites North Carolina's Research Triangle Park, New Jersey's Pharma Corridor, the biotech clusters in California and Massachusetts and the Animal Health Corridor in Kansas as examples of leading clusters the state should emulate. Georgia Bio, an organization promoting life sciences in the state, and the University of Georgia's Selig Center for Economic Growth released a report in September assessing the sector's progress. The report says there are nearly 300 life science companies in the state, employing more than 15,000, and producing nearly $8 billion in annual product sales. The state ranks 12th in the nation in the amount of venture capital invested in biotech companies. About two-thirds of Georgia's industry is in the greater Atlanta area, with significant clusters also in Athens and Augusta. Charles Craig, president of Georgia Bio, says life sciences is the fastest growing industry sector in Georgia over the past four years. "We have a diverse and robust life sciences industry, ranging from established companies to startups in pharmaceuticals, biotech and medical devices," Craig says. "That fact is probably not well known outside of Georgia. BIO will give these companies an opportunity to showcase themselves to the world and will allow the world to know there is some advanced research going on here." Ken Stewart, commissioner of the Georgia Dept. of Economic Development, says a new tax credit for startup companies passed in the state's last legislative session will help encourage entrepreneurship. 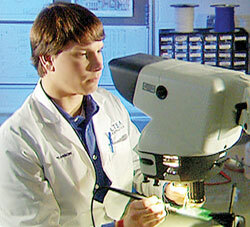 He believes BIO 2009 will provide a major boost to the state's industry. "We are new on the BIO cycle, and we did a lot of work to attract interest during the BIOs held in Boston and San Diego. We are putting a lot of resources into it and are expect a very good turnout. We intend to be on the BIO cycle every four years." Stewart notes that the 2008 Kauffman State New Economy Index ranks Georgia 14th in availability of venture capital. "We have the wealth available in Georgia, and we are working to be more like Silicon Valley and Boston in terms of making capital available," Stewart says. "No matter where you go in the country, there is always a claim for the need for venture capital. We as an agency are working with private groups to bring people at our research universities together with venture capital money." "The medical device industry has seen some limited growth during the last few years," says David Stern, senior vice president of scientific affairs at CardioMEMs. "There have been a number of recent startups spun out of hospitals or other companies. While there has been some activity, these companies face the issue that Atlanta is not that large of a device community to begin with. In order for it to grow, things have to happen, and those things happen slowly." CardioMEMs develops implantable wireless pressure sensors that monitor the progress of various diseases. Stern says lack of financial capital and a lack of well-trained staffing in sufficient numbers are the two primary challenges. "The challenge most companies face is in recruiting someone from outside the area. There's always the question, 'If I move myself and my family to take a new job and then that job has some endpoint, will I have to move on to stay in the industry?' The answer is, 'Probably.' "
Stern says that BIO will put a "nice magnifying glass" on the Atlanta area. He says that while the conference is traditionally biotech, many Atlanta-based medical device firms will be attending. "CardioMEMS has put in a proposal to host an industry-sponsored session," he says. "Because the type of technology we have is used in conjunction with pharmaceutical therapy, we are looking at something we can be actively involved with." Startups springing from the technology developed at Georgia's major universities have been the major propellant for growth in the industry. Many have come out of plant and animal science research at the University of Georgia in Athens. "Georgia is at a really interesting inflection point in this industry," says Margaret Wagner Dahl, director of Research Development and Technology Alliances at the University of Georgia. 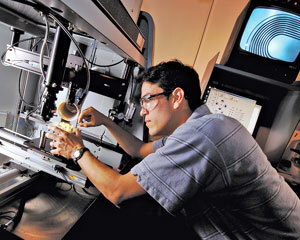 "The biotech industry is a young industry. It's been pretty remarkable how well we have been able to create structures and processes to pull these kinds of opportunities out of our research universities and strategically put resources in place to ensure that a startup has the potential to become a sustainable business." Dahl, who is also director of business and economic development at the Georgia BioBusiness Center at the University of Georgia, says the University averages about three startups annually and has created 106 companies since 1974, about 65 percent of which are still around. Dahl says the state has an array of valuable assets such as the Georgia Research Alliance, the Life Science Seed Fund, and the Life Science Facilities Fund that promote the industry. She believes the state has sufficient programs and structures to help fledgling companies succeed, but there remains a need for resources to take companies to the next level. One of the success stories spinning out of UGA research is Synageva, the biotech company formerly known ad Avagenics. Synageva focuses on developing transgenically modified chickens to produce eggs with a unique protein expression system. The company, founded about a decade ago, has R&D and manufacturing operations in Athens, and established its headquarters office in Boston in September 2008. "It's an exciting time for a company like Synageva," says Sanj Patel, who came over from Genzyme in Boston in July to take the helm as Synageva's president and CEO. Patel says Synageva opened its Boston office so the company can stay in "the loop" with developments in that premier biotech cluster. "We are keen to loop into the Georgia technical sector, but at the same time my background is in Boston and I am very tied in to the Massachusetts biotech organization," Patel explains. "It's important for companies in Georgia to maintain a state approach, but at the same time loop into other states with heavy biotech infrastructure." Differing from some of his Georgia counterparts, Patel believes life sciences companies with strong commercial plans and the proper focus can find sufficient venture capital. "If you have the right plan, the funding will come and it won't matter where you are," Patel says. "The industry is nationalized in that sense."